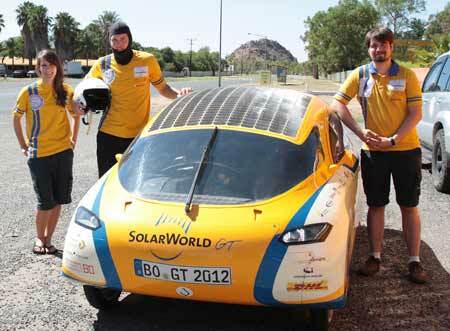 The first solar car ever to circumnavigate the world passed through Central Australia this weekend. The two seater SolarWorld Gran Turismo, the brand-new ‘sun chariot’ of the University of Applied Sciences Bochum, Germany, is also traversing North America, Asia and Europe in its epic one-year venture, crossing the equator twice. “It is the first time in history an for an energetic autarkic powered solar vehicle to circumnavigate the world,” says spokeswoman Mareike Bautsch. “For an official circumnavigation it is necessary to travel at least 28,500 kilometers by land. The car and crew are pictured in Alice Springs. Crew of three and two seats?